The idea for this book was conceived in early June, 2005 at a paleoaltimetry workshop held at Lehigh University, Lehigh, Pennsyalvania and organized by Dork Sahagian. The workshop was funded by the tectonics program at NSF, and was designed to bring together researchers in paleoaltimetry to discuss different techniques and focus the community on ways of improving paleoelevation estimates and consequent interpretations of geodynamics and tectonics. At this meeting, some commented that a comprehensive volume describing the different methods could help advance the field. I offered to contact the Mineralogical Society of America and the Geochemical Society about publishing a RiMG volume on paleoaltimetry. Because many of the techniques used to infer paleoelevations are geochemically-based or deal with thermodynamic principles, the GS and MSA agreed to the project. Two years and roughly 1000 e-mails later, our book has arrived. Geodynamic and geomorphologic rationale (Clark). 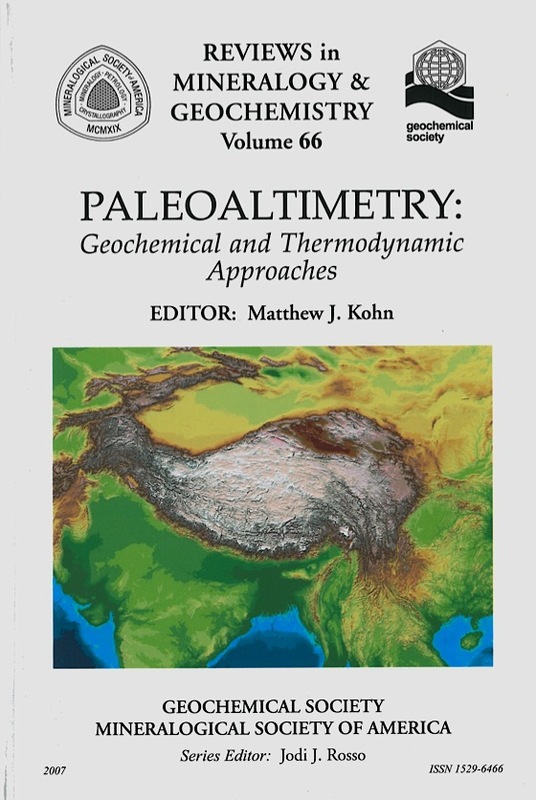 This chapter provides the broad rationale behind paleoaltimetry, i.e., why we study it. Stable isotope proxies. 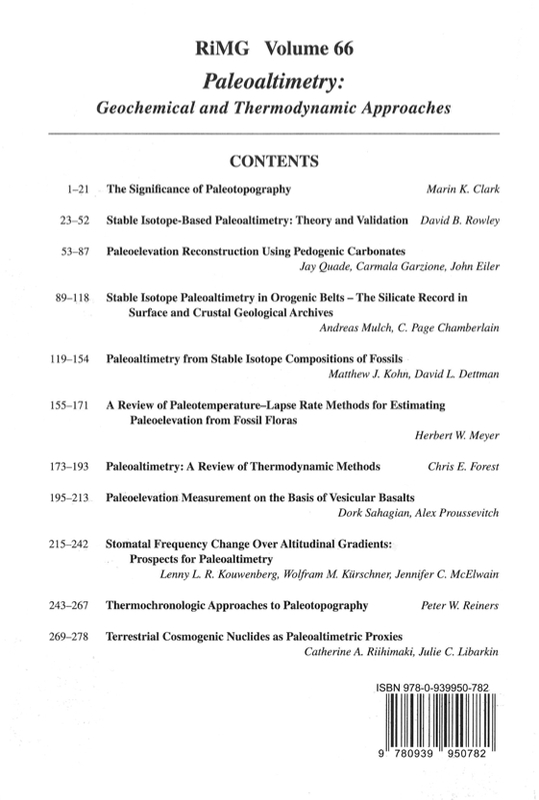 These 4 chapters cover theory of stable isotopes in precipitation and their response to altitudinal gradients (Rowley), and stable isotopes sytematics in paleosols (Quade, Garzione and Eiler), silicates (Mulch and Chamberlain) and fossils (Kohn and Dettman). Proxies of atmospheric properties. These 4 chapters cover temperature lapse rates (Meyer), entropy (Forest), and atmospheric pressure proxies, including total atmospheric pressure from gas bubbles in basalt (Sahagian and Proussevitch), and the partial pressure of CO2 (Kouwenberg, Kürshner, and McElwain). Note that clumped isotope thermometry (Quade, Garzione and Eiler) also provides direct estimates of temperature. Radiogenic and cosmogenic nuclides. These 2 chapters cover low-temperature thermochronologic approaches (Reiners) and cosmogenic isotopes (Riihimaki and Libarkin). Some chapters overlap in general content (e.g., basic principles of stable isotopes in precipitation are covered to different degrees in all stable isotope chapters), but no attempt was made to limit authors' discussion of principles, or somehow attempt to arrive at a "consensus view" on any specific topic. Because science advances by critical discussion of concepts, such restrictions were viewed as counterproductive. This does mean that different chapters may present different views on reliability of paleoelevation estimates, and readers are advised to read other chapters in the book on related topics – they may be more closely linked than they might at first appear! I hope readers of this book will discover and appreciate the synergy among paleoaltimetry, climate change, and tectonic geomorphology. These interrelationships create a complex, yet rich field of scientific enquiry that in turn offers insights into climate and geodynamics.